Another fixer-upper 7A28-7120 RAF Gen. 1 with a chronograph fault, which I'd suspect will probably turn out to be a relatively easy fix. Fitted with a leather strap, rather than the customary NATO. Opening bid @ only £49.99 - the 7-day auction should be worth watching. 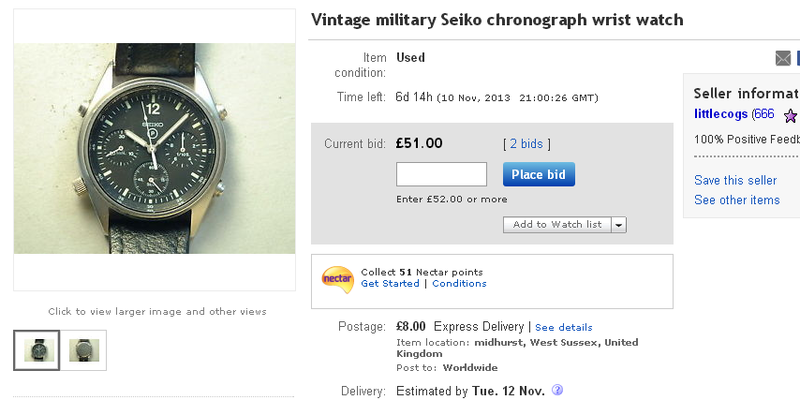 Vintage Military Seiko Chronograph wrist watch. The watch is working but the chronograph is not, the reset pusher does not seem to work so the watch may need a service to rectify these issues. 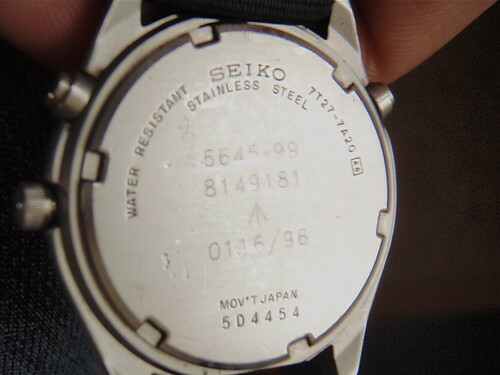 The dial is signed: Seiko P Japan 7A28-714L T. The case back is stamped: Seiko Stainless steel Water resistant 7A28-7120 6645-99 768056 10692/90 013424 Japan. Case diameter measures 37mm. We post packages on either Monday or Thursday or on nearest day once payment has been received. A very good quality wrist watch to add to a collection. I was out yesterday evening, so please excuse the slightly later than usual reporting of these couple of results. 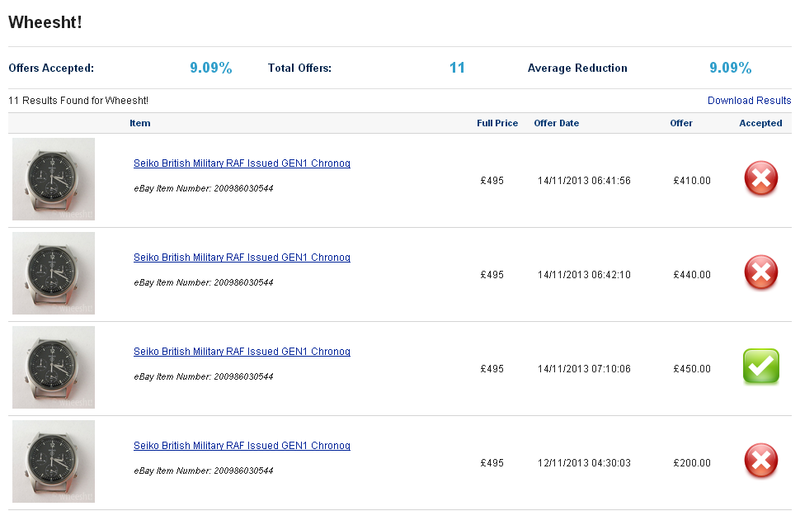 It culminated in something of a mini snipe-fest, selling for £304.99 after 25 bids. Won by a member of this forum, if I'm not mistaken. You'll notice I wrote 'couple of results'. 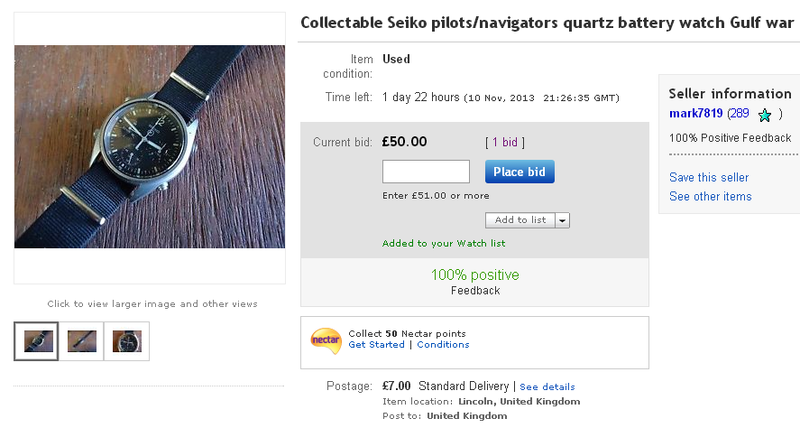 Collectable Seiko pilots/navigators quartz battery watch has a 0995/90 and 7A28 under the Nato stock number believe to be as used in the Gulf war sold as spares or repairs the black nato band is brand new one any questions please ring me on 07949671782 Mark. I'm not sure how I failed to spot it when it was first listed back on October 31st - I presume it was something connected with the seller having amended his listing description on November 7th (note '7A28' is in a different font), but it didn't come up in any of my various searches until there were less than two days of the 10-day listing left to go. At which point there was still only one bidder @ just £50. I decided to have a punt at it - just for the sheer hell of it, really. But because I knew I was going to be out for the evening, I set up AuctionSniper and left it to do the dirty business for me. You can tell how badly I wanted one of these (not), because I bid under £200. It sold for £204.67 (just a Fiver over my maximum bid) after 8 bids. Am I upset at being out-sniped. Yeah, heart-broken, right. Once again would-be eBay seller Wheesht! 's 7A28-7120 RAF Gen. 1 goes unsold. Perhaps he'll decide to keep it (again) this time. The listing received some 273 views over the course of this 7-day listing, and best I can tell, at peak 25 people had been watching it. Bearing in mind that this greedy would-be seller had previously declined (more than generous) offers £500 in October and £480 more recently, (against previous listings), I'm sure we'd all be interested to know what figure he finally agreed to accept, wouldn't we ? I went for this as it looked to be in very good condition, and I do like getting things working again. When it arrived none of the pushers were working. Hmmm, not a good sign. Opening it up revealled a very clean movement and there was no evidence of battery leakage or moisture. I took the back plate, PCB and 710 spacer block off and everything looked in tip top shape. That's good, but why aren't the pushers working? Removing the pushers revealled the problem - caked on dirt, at least 1mm of it in each of the pusher wells. 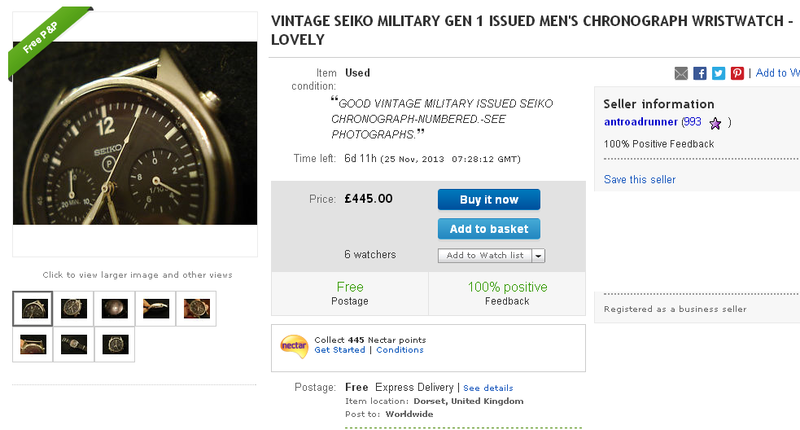 I guess given its provenance as a military watch, this one got out and about a bit. It needed a new crystal, so the case and pushers got a good ultrasonic clean while I was at it. Then the pushers were greased and re-fitted and everything works perfectly. Yes, I thought that one might turn out to be an easy fix, Simon. as we know from this thread. But I suspect that one may turn out be in even better cosmetic condition, going by the seller's photo. Now I'm definitely no expert on 7A28-7120 RAF Gen 1's (see seller's description). But I do have an exceedingly good memory. As soon as I saw this new eBay listing created early this morning, it struck a chord. 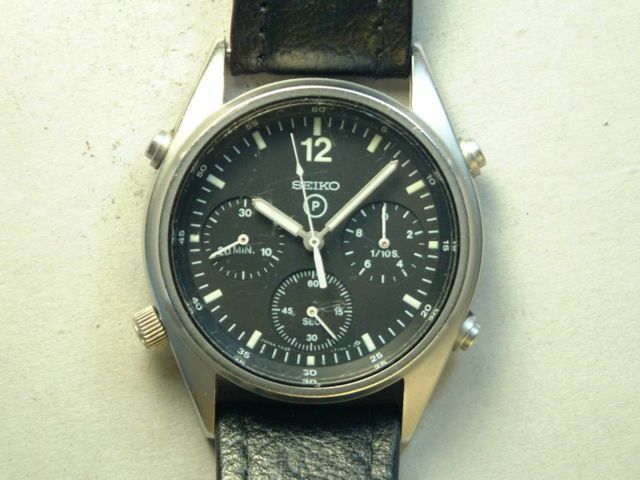 Not for the watch in particular, but the eBay seller's username - antroadrunner. 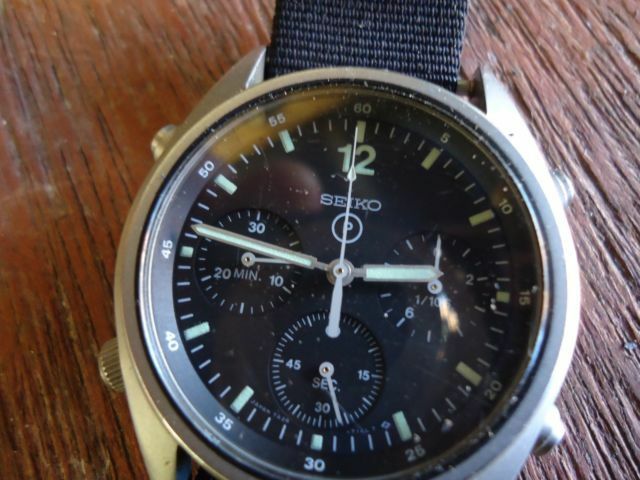 VINTAGE SEIKO GENERATION 1 MILITARY ISSUE MEN'S WRISTWATCH. I AM NOT AN EXPERT ON THIS ITEM BUT MAY HAVE INTERESTING MILITARY HISTORY. EXCELLENT WORKING CONDITION. USED NATURALLY AGED CONDITION. SEE ALL PHOTOGRAPHS - SOLD AS SHOWN. NICE SOLID MILITARY STAINLESS STEEL WATCH. If you're wondering why I happened to remember his user ID - read through page 1 to get a flavour of what this chancer gets up to. I'll never understand the logic of eBay sellers who set up auctions with a 99p opening bid price but set the reserve price much higher. 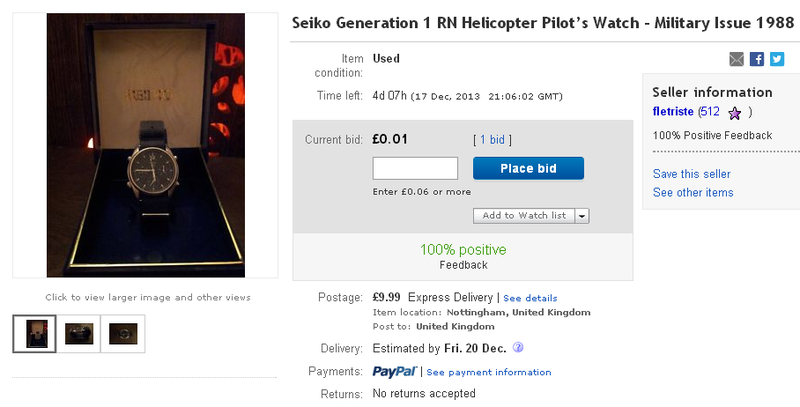 Good condition Seiko Royal Navy Helicopter Pilot’s watch. 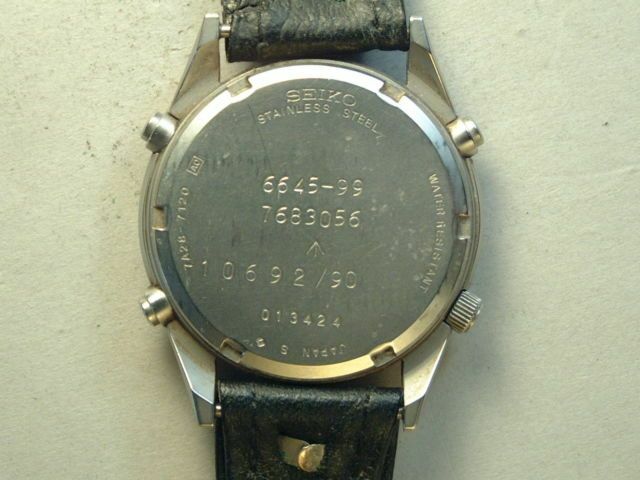 The watch was originally issued in 1989 and due to being a military issue, has usual marks on it as one would expect. It is a very desirable and highly collectible watch due to the fact that it is a practical and functional watch and the choice of the British Armed Forces for use with the helicopter pilots. Another thing adding to the collectability is the rarity of the watch, there were issued in no doubt in many numbers but not many survived life outside the armed forces where servicemen were required to give watches back once retired from the forces, on some occasions they could buy them if they wanted to keep them but not many servicemen took up this option. I was fortunate enough to forget to return mine hence the serial number being removed and the back case covered with blue paint. Genuine military issue item for the UK armed forces. If it is good enough for them, it is certainly good enough for everyday use. These are getting increasingly harder to find and as a result the prices are climbing. It is made in Japan with Japanese made quartz movement. It has a sandblasted all stainless steel case with fixed bars for operational security reasons. The dial is matt black with subsidiary seconds at the 6 position, the thirty minute elapsed timer at 9 and the 1/10th second elapsed timer at the 3 position. When the chronograph is activated, the 10th second timer moves straight into action in a very fast rotation. The inner bezel has sixty second markings, and the chronograph sixty second recorder is the sweep hand. This is comfortable to wear, and an excellent watch. Width is 38 mm excluding crown and 40 mm including crown and pushers. Lug to lug is 43 mm and thickness is 9 mm. 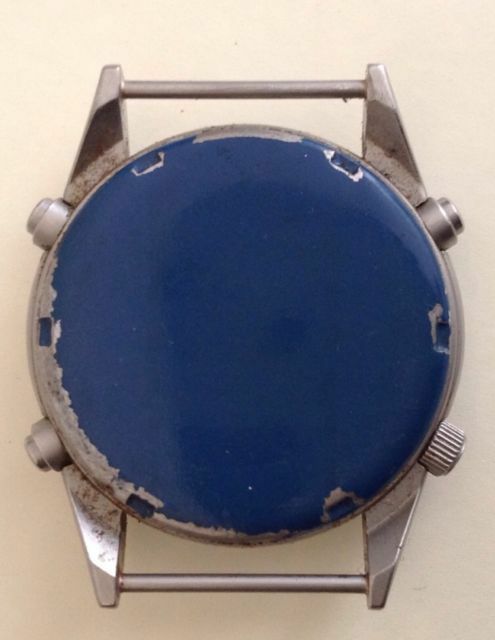 Watch needs new battery, casing rubber gasket and possibly a new winder spindle. Pity about the ruined case-back though. I don't know much about Gen 1 & 2 models, so please excuse my ignorance. 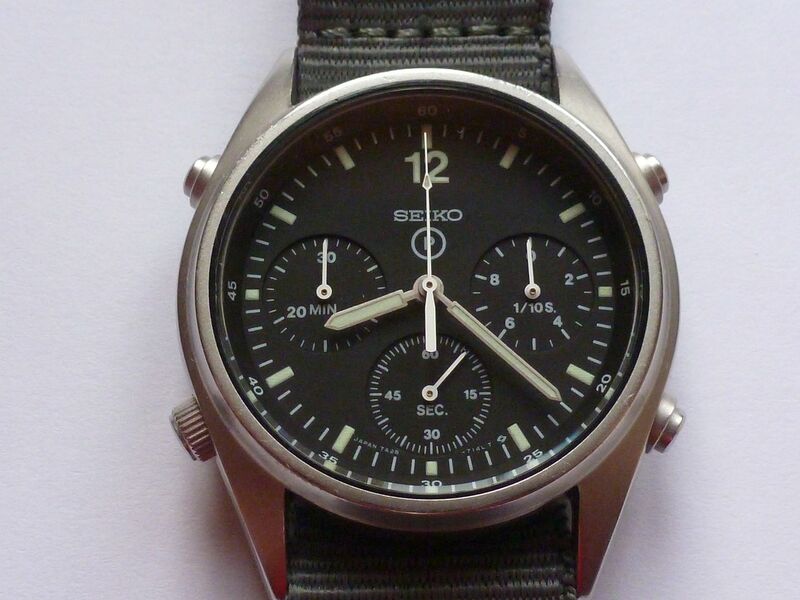 I'm hoping you can shed some light on something that's confusing me: I've seen a few Gen 2 watches on ebay; they're labelled as issued, but don't have the issue numbers on the back. Does that mean they're not issued? Are those numbers essential, and do they effect the value? Simple. The 7A28-7120 RAF Gen. 1 was only ever issued by MOD stores to military personnel. The later 7T27-7A20 RAF Gen. 2 was also available commercially - for sale to the general public. 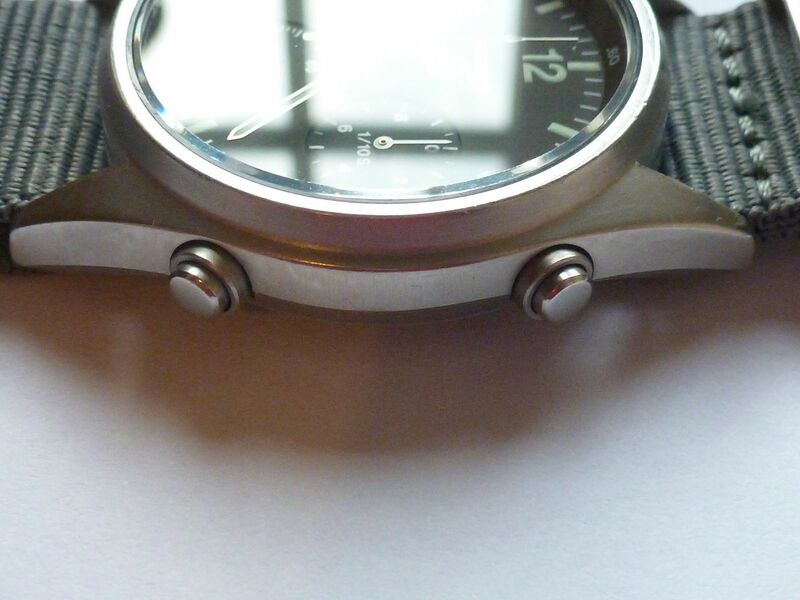 So if it isn't stamped with the NSN / issue numbers (as in your second photo) - it isn't an issued watch. The seller is being dishonest. I don't normally follow the prices of Gen. 2's, but as a rule of thumb, I'd reckon to pay about half the price for the 'civilian' version. I'm currently looking for a Gen 1 & 2, but finding issued ones in good condition at a reasonable price is proving to be problematic! Look again closely at that photo and you'll see traces of the original NSN and issue numbers - they've almost been worn away by the action of the NATO strap chafing on the case-back, but they are there. Yup. Yours truly was the high bidder @ £123 - less than half the seller's £250 reserve price. Thought someone might have outbid me. Another somewhat over-optimistically priced auction listing for a 7A28-7120 RAF Gen. 1 appeared on eBay a little over 24 hours ago. Once again the would-be seller's somewhat unusual choice of user ID rigsbydidjones struck a chord in my memory. I'm obviously spending far too much time looking at these things. 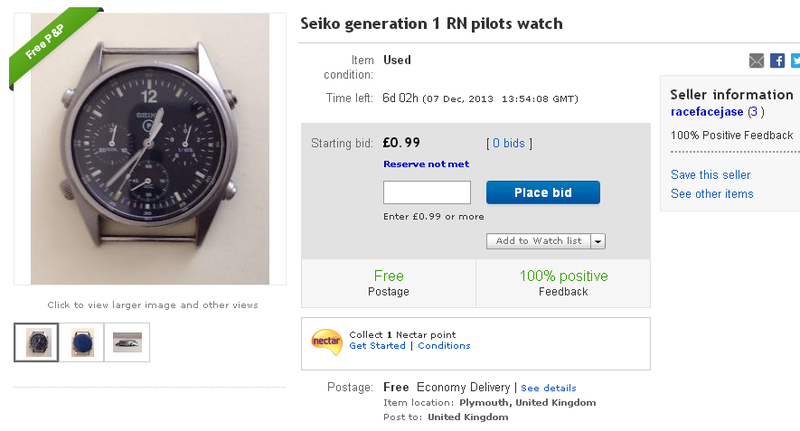 Seiko Gen 1 RAF Watch up for sale. Excellent condition and in full working order , as it was checked over by Prestige Time Services last year where a new crystal was fitted , new gaskets and cleaned. Please examine pictures to satisfy yourself with condition. Payment within 72 hrs of auction finish , will be posted recorded delivery when payment has been received. Perhaps that's what he's based his current opening bid price on - thinking this one must be worth at least 10 times the price. I was looking at the recent listing, £515 Gen 1. Looks to be in good condition. I know you said the seller is being over optimistic, but do you think it's actually overpriced and not worth paying that amount for it? I do, but then that's my own personal opinion, simply because I don't believe any of these watches warrant such prices. Suggest you read back through the previous pages - particularly the saga of Mr Wheesht! and his 7A28-7120 RAF Gen. 1. Athough the replacement crystal in his watch wasn't fitted squarely, it appeared to be in a similar cosmetic condition - best as one can tell from photos. His original asking prices were: £590 / £595 - but it finally sold for £450. I'd recommend you sit on your hands for a while. But don't worry if someone else caves in and goes for it at the opening bid price of £515. There'll always be plenty more. Has been well kept with light use The watch will be well packed, and comes with the NATO strap and presentation box as pictured. 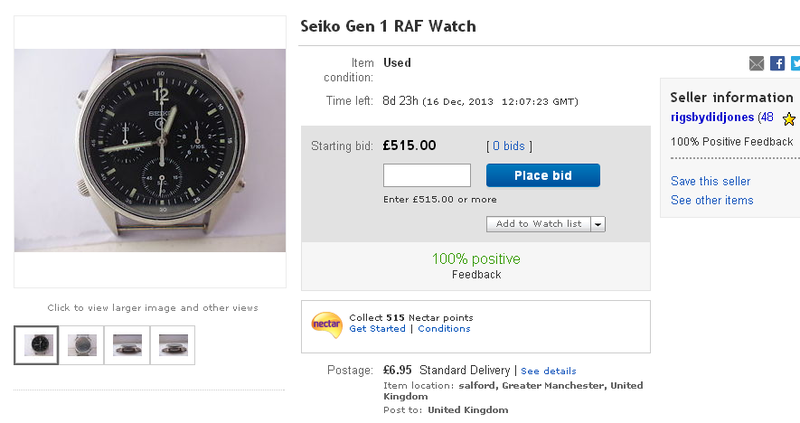 I would expect a very basic service might allow this watch to be brought to full functionality but based on the above this watch is sold as seen so please ask any questions prior to placing a bid on the auction. and please check out my feedback for full assurance of a smooth, genuine sale. Lousy photos and possibly some easily remedied chrono' faults - might be worth someone (capable of basic repairs) taking a gamble. 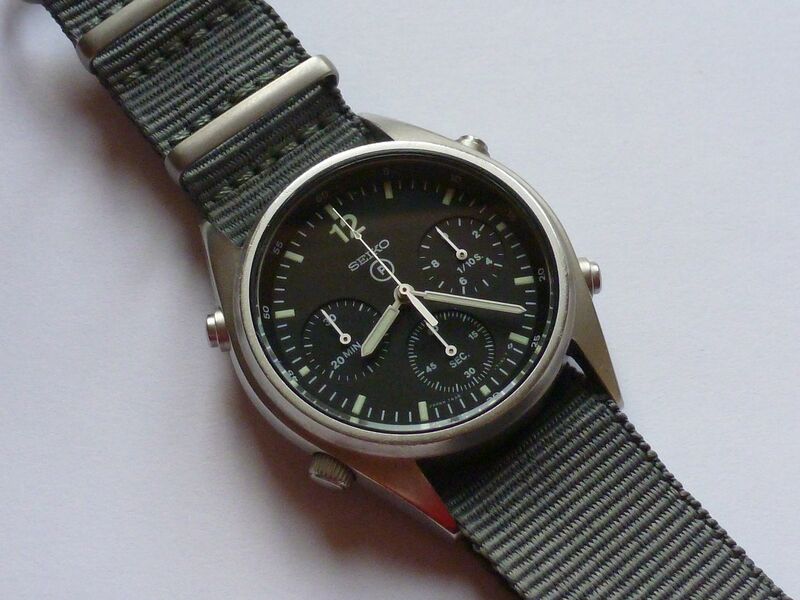 Another opportunist eBay seller looking for a Monkey (in more ways than one) for his 7A28-7120 RAF and / or NAVY Gen 1. The watch is in a Excellent used condition. All functions working as they should. Watch Glass has no marks scratches & Case only has very minimal wear. This was obviously very much looked after & cared for (please inspect photos carefully). New Renata battery & case back gasket fitted using Seiko's own silicon sealing grease throughout. 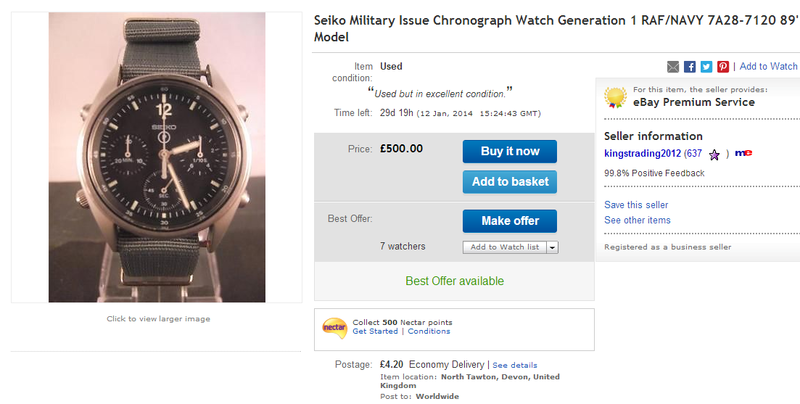 Comes with a new, never worn genuine military issue 'NATO' strap (please see photos). Many years of precise timekeeping with no hassle. Please inspect all photos throughly before bidding. The poor quality images make it almost impossible for me to bid! Moreover, there isn't an image of the back. Urgh. Annoying. The seller needs lessons on marketing. Looks to be in rough shape. I'd rather pay £15 more for the other one (assuming no one else bids). But then again, your monkey comment has scarred me, so I may have to wait for a better deal to come along.